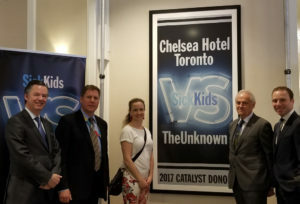 Chelsea Hotel, Toronto has committed to raising $500,000 over the next five years in support of SickKids VS Limits, the largest fundraising campaign in the history of Canadian health care. The pledge brings the hotel’s commitment to The Hospital for Sick Children (SickKids) to more than $1 million and earned it recognition as a Catalyst Donor—a community leader who shares the hospital’s vision and who can help transform that vision into a reality and revolutionize pediatric health care access, quality and effectiveness in this country and around the world. L to R: Rob Housez, General Manager, Chelsea Hotel, Toronto; Sean Schurr, AboutKidsHealth; Kathy Motton, Patient Ambassador, SickKids; Josef Ebner, Regional Vice-President – Canada and Managing Director, Chelsea Hotel, Toronto and Adam Starkman, VP Corporate Partnerships, SickKids Foundation at May 23 announcement of property becoming a SickKids Catalyst Donor. The property is a generous and long-time supporter of SickKids. Since 2013, it has donated $500,000 in support of AboutKidsHealth, a online resource created by hospital’s experts. In addition, as part of the SickKids community, the hotel has formed a special relationship with the hospital’s patients and their families through the Chelsea CARES Program, which provides accommodation for families in need, creating a home-away-from-home in what can be scary and stressful times. SickKids is taking on the greatest challenges in child health with the largest fundraising campaign in Canadian health care history with the unprecedented goal of $1.3 billion through philanthropy. It supports three key elements: re-imagining the campus, including building a new patient care centre on University Avenue ($600 million); continuing breakthrough paediatric health research ($600 million); and establishing partnerships for better, coordinated patient care ($100 million). The campaign period is anticipated to run through to March 31, 2022. The 1,590-room Chelsea Hotel, Toronto is Canada’s largest hotel. Located in downtown Toronto, the independent property is part of the Langham Hospitality Group’s international portfolio of hotels and resorts.